Sportsbet.io is one prime example of a bitcoin sportsbook, where players can use bitcoins to the fullest. This sportsbook has been set up with the help of the Coingaming platform for betting and casino gaming, one of the more successful bitcoin platforms. On top of that, the site is licensed by a major licensing jurisdiction, which is Curacao. Creating an account at Sportsbet.io doesn’t take more than 15 seconds thanks to the nature of the bitcoin, which offers complete anonymity where you are not asked for many personal details. After that a world of betting opportunities will be opened to you where you can bet on the most and least popular sports markets. 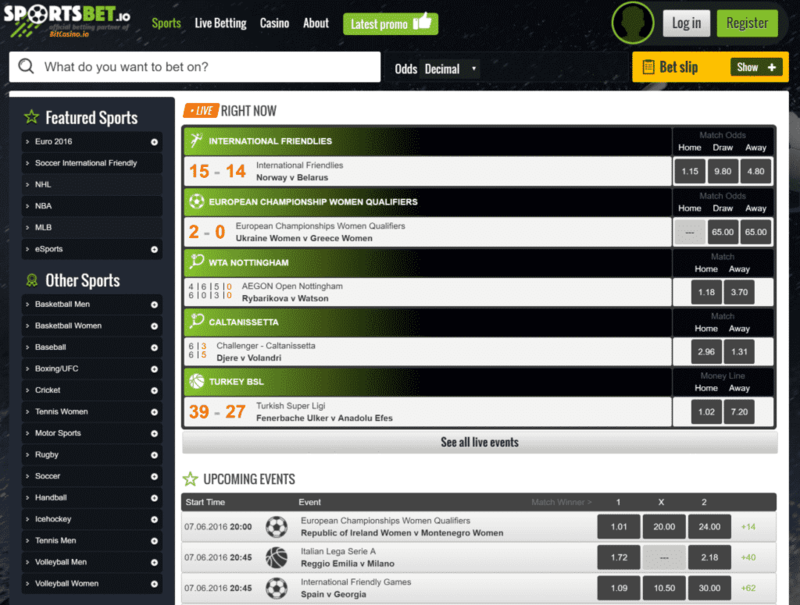 At Sportsbet.io you will find various sports events to bet just like with any major sportsbook. In the Featured Sports menu you will find what is most popular among Sportsbet.io users, while in the Other Sports menu you will find the entire list of sports markets to bet on. However, the following are the most popular ones. On top of that all the major continental and world competitions are encompassed. Every time there is Euro Cup, World Cup, African Nations Cup or even club competitions like Copa Libertadores or the Champions League, you can find odds at Sportsbet.io. eSports is growing to be one of the most popular sports to bet on. Every day more and more sportsbooks include eSports events into their offer, and the same is with Sportsbet.io. The Bitcoin eSports betting calendar at Sportsbet.io is rich with events. Any major tournament like The International or other can be used for placing bets. The most popular eSports is Dota 2 without a doubt, but Sportsbet.io players love to bet on other too such as League of Legends, Starcraft 2, Counter-Strike: Global Offensive etc. NBA is an obvious choice here, but you can also bet on European leagues as well such as the Italian, Russian, German and other. You can also bet on the European continental competitions, women’s basketball such as WNBA and major national team tournaments such as the World Cup, European Cup and all that. Of course, NBA is not the only American sport that you can find at Sportsbet.io. Other equally popular American sports among Sportsbet.io bettors are NHL, NFL and the MLB. You may even find some promotions that are tied to these leagues when it’s playoffs time. And to conclude the offer many other sports can be found here too. These range from the least popular ones like Aussie Rules, Badminton, and Handball to more popular ones like Formula 1, Boxing and UFC, Tennis, Horse Racing and Ice Hockey. In total you can find more than 15 sports at any given time. To complete the offer Sportsbet.io has set up a live betting platform too where you can place live bets on your favorite events as they happen. Usually the most standard live sportsbetting offer encompasses sports like soccer, basketball, NFL, MLB and other that may be popular at the moment. Can I Play Casino Games at Sportsbet.io? Sportsbet.io recognizes that sometimes betting lovers are casino enthusiasts too, which is why they have set up a casino gaming section where you can use your bitcoins to wager on the different casino games. Here you can play blackjack, video slots, roulette, video poker, poker, progressive jackpots and other all supplied by major game providers like Betsoft among the many. The customer support team at Sportsbet.io is available 24 hours a day and can be reached by two conventional methods such as email and live chat. The email option is the slower way of getting help so you can use it when your issue is not urgent. The live chat option on the other hand gives you an instant way of communicating your problem. Also, for more common questions you can visit the FAQ page. Bitcoin players seem to have more and more places where to spend their bitcoins by betting on sports events. The online betting industry has shown great vision in accepting this crypto-currency and may very well become the standard currency in several years overcoming traditional currencies which sometimes are just a barrier towards online betting. Sportsbet.io is at the forefront of that betting revolution without a doubt. As a silver member of the Bitcoin Foundation, a license by the Government of Curacao and a team of professionals with an experience in the betting industry, Sportsbet.io may become one of the leading bitcoin betting sites.